Members of California Task Force 3’s (CA-TF3) Water Rescue Team, one of 28 Federal Emergency Management Agency (FEMA) National Rescue Response Teams, is one of the only teams that have been deployed to the State of Texas as part of a nationwide response to Hurricane Harvey that is authorized to use Drones. The 16 Water Rescue Team members deployed come from not only the Menlo Park Fire District that sponsors the Task Force, but also from Central San Mateo County (Burlingame, Hillsborough and Millbrae), Palo Alto, San Jose, San Mateo and South San Francisco Fire Departments. 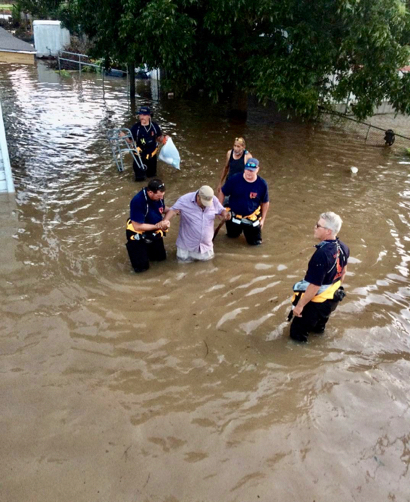 Responding from a staging area in Katy, Texas, early Thursday morning, the Bay Area’s Water Rescue Team was headed to the City of Wharton where the Colorado River had overflowed and was flooding the City and the surrounding areas. Enroute, a team member noticed a dog in trouble and struggling in three feet of water near the town of Hungerford, so the convoy of four trucks, two enclosed boat trailers and a suburban command vehicle quickly pulled over and rescued the mixed breed animal and then raced on to Wharton. The Team was first tasked with conducting Search and Rescue Operations in the rural and muddy waters of the agricultural and farm lands that surround the City of Wharton. Captain Tony Eggimann (pictured top) quickly prepared one of three Drones brought by the Team used to scout out several miles of area from the air. While the boat crews prepared the six boats, he determined clear routes of travel and the exact location of farms and buildings so they could expedite the search and not waste time, something the veteran Hurricane Katrina responder was more than familiar with. He quickly and efficiently guided a DJI Mavic Pro Drone up to an altitude of 200 feet and flew a reconnaissance 360 degree ring around the area noting where the flooding started and ended, locating navigational landmarks, potential hazards and counted 30 structures located on several farms that would require contact by the boat crews from Task Force 3. He quickly downloaded several pictures and a video to his water proof iPad and jumped into one of the awaiting boats. The aerial “situational awareness” Captain Eggimann gained helped the flotilla to quickly and directly navigate to specific and targeted farms and buildings. While no one was found, the Team placed a search marker on each of the buildings. Captain Eggimann is a founding member and one of five certified Drone Pilots with the Menlo Park Fire Districts UAV/Drone Program. The Fire District is one of a small number of public safety agencies nationwide that can fly anywhere in the United States, day or night, with FAA approval. 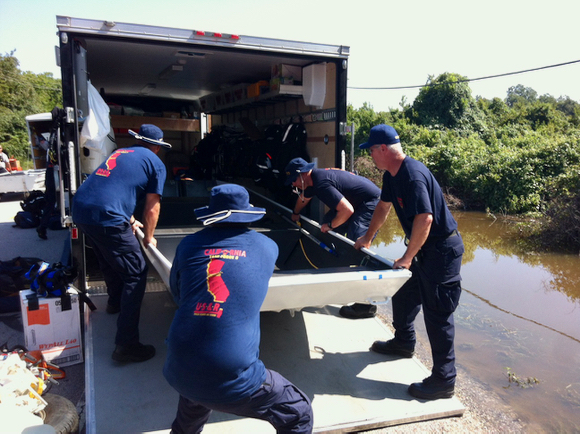 Next, the CA-TF3 Water Rescue Team loaded onto Texas National Guard High Water Military Vehicles and was transported along with other FEMA Water Rescue Teams from California and around the country. The City was broken up into multiple search areas, and the CA-TF3 Team was assigned several blocks consisting of roughly 50 homes. Water depths varied from zero to seven feet. With the help of Texas Guards they navigated around most of the area without needing to use a boat. The Team returned to the Katy Texas around 10 pm Thursday evening in good spirits and ready Friday operations.